The Musical Laser Rainbow Machine makes music into colored laser patterns of light that move and respond to the music. Wizard's Run is a Rolling Ball Sculpture featuring a ball-levitating wizard, four balls bouncing through the air, an unusual "wobble lift", and a flying magic carpet. Par One is a small rolling ball sculpture with a golf theme. Small golfers hit golf balls onto a track, and succeed in getting a hole in one with the help of a gopher, a duck, and a squirrel. Another small fellow makes sure there enough balls with a ball dispensing machine. 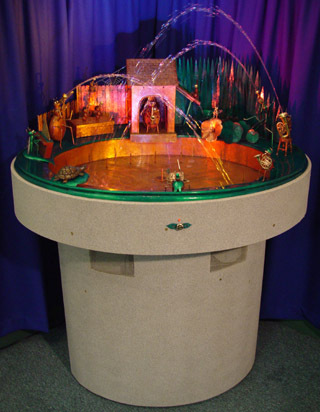 H-2-Opus: a musical water fountain with a band of insects. The insects play instruments shooting water from their instruments in time with the music, and aided by lights, lasers, and a fog machine. Vic's Rolling Ball Sculpture has a circus theme, with a flying helicopter, a clown firing a ball out of a cannon, and other delights. Weighs less than 3 pounds including case! motor, the Tesla coil, the transformer and greatly responsible for AC electricity in our homes instead of DC.) I am not sure I agree with Tesla completely, but this sure says a lot about how much fun it is to make things. "Life is pretty simple. You do some stuff. Most fails. Some works. You do more of what works. If it works big, others quickly copy it. Then you do something else. The trick is doing something else."